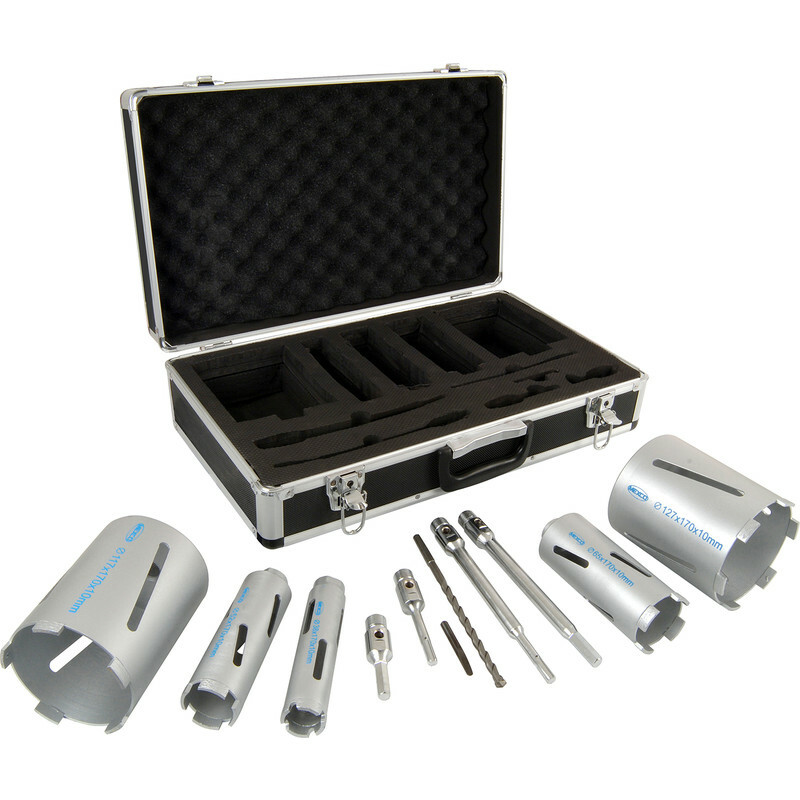 Kit contains 38mm, 52mm, 65mm, 117mm and 127mm diamond core drills, 240mm hex with SDS arbor, 80mm hex with SDS arbor, A-taper pilot drill and drift key. Not to be used on hammer action. Mexco technical / returns helpline No. 0845 602 4274. Premium Dry Diamond Core Drill Set 5 Core (Kit) is rated 4.0 out of 5 by 6. Rated 2 out of 5 by Mikeeeeee from Drills good holes but SDS adaptor not fit for purp The first set destroyed the SDS adaptor after a few holes. The replacement only lasted 2 holes before the adaptor started to fracture. Its a real shame as the drilling heads seem great. BTW I didn't use hammer action! Rated 5 out of 5 by SMcN from Premium Dry Diamond Core Drill Kit Bought this kit to do a job, Fantastic quality and great case to keep it altogether. Cuts through black brick no problem with no hammer action. Rated 5 out of 5 by Pete precise from Core Drill Good product easy to use and good value.you do need a substantial drill to use it effectively. Rated 5 out of 5 by hmmmnz from pretty good for the money Bought the set to drill through a double brick wall. Did it with ease with no desernable wear. The mandrels were long enough. And was good to have the option of using a sds or regular drill.